Thanks to texting and social media, teens today have many more ways to reach out to a crush than in the analog days of using the family telephone and passing notes in the hallways. But according to a recent Pew Research Center report, some romantic traditions remain the same. 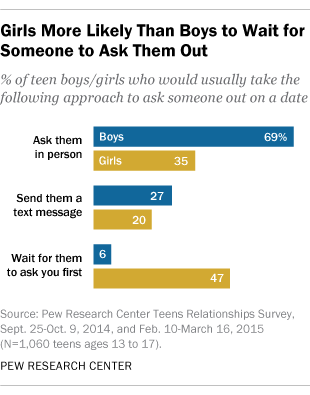 The most common way for teenage boys to ask someone on a date is to ask a girl in person rather than via text message. And nearly half (47%) of teen girls say they usually wait for someone to ask them out first, compared with only 6% of boys. Girls are also much less inclined than boys to ask someone out, whether in person (35% girls vs. 69% boys) or via text message (20% vs. 27%). Overall, our report on teen romance found boys and girls have a lot in common when it comes to asking someone out by calling on the phone, messaging on a social networking site or getting one of their friends to do the asking. But there were a few gender differences worth noting. Social media is an important venue for connecting with someone and deepening romantic relationships, but this is especially true for teen boys. Among teens with relationship experience who use social media, 65% of boys say platforms like Facebook or Instagram make them feel more connected with what’s happening in their significant other’s life, compared with 52% of girls. Boys (50%) are also more likely than girls (37%) to say social media makes them feel more emotionally connected to their romantic partner. But there’s also a more negative side to teen dating and social media. Girls are especially likely to experience inappropriate flirting on social media, with about one-in-three (35%) reporting they have blocked or unfriended someone whose advances were making them uncomfortable. This is more than double the share for boys (16%). Overall, 27% of teen daters have used social media to keep track of their romantic partner’s whereabouts. This practice is somewhat more prevalent among girls than boys. One-in-three girls with dating experience say they have used social media to keep track of their significant other, compared with 22% of boys. Post-breakup, girls are more likely to erase their ex from their social media lives. 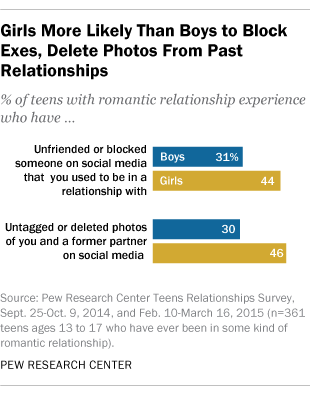 Some 44% of teen girls with dating experience have blocked or unfriended an ex on social media, compared with 31% of boys. Girls who date (46%) are also more likely than boys (30%) to delete or untag photos from a previous relationship. By and large, teen boys and girls tend to use the same methods to keep in touch, and they share similar expectations for how often they’d like to hear from their partner. The one slight difference is in frequency of texting. Texting is by far the most common means for all teen daters to communicate with their romantic partner, but girls use texting more frequently than boys: 79% of girls say they spend time texting their partner daily, compared with 66% of boys.